Hi does anyone have diy their own sump out of acrylic? Are they tricky to make a regular one(intake, refugium and return). Will it be more expensive than glass? Any thoughts or suggestions welcome. I built a few...my largest being my 8foot sump. Its quite easy. and I highly recommend it over glass for the sump. its more forgiving, it can be easily repaired in minutes and you dont care if you scratch it, it can be cut with a variety of tools ... I could go on and on.. he he Did I mention its 10times stronger then glasss... great piece of mind. want even more strenght, get polycarbonate harder to glue but 200-300 times stronger then glass. You want to use methyl chloride for every bonds and everything you attach ( corners, baffles, walls, bracing etc ) this melts the acrylic and welds it together into a one solid piece ( at molecular level ). then I apply a bead of weld-on 16 across all joints for added safety and to stop any leaks that could have been missed. ( think of it like silicone with some pl premium in it.. lol ) weld-on is more like a filler glue, its not a molecular bond, so its not as strong as methyl chloride. weldon 16 is Methylene Chloride too, it just has acrylic resin added as a filler and gives you a longer work time. if you can buy a tank the right size, it's probably cheaper / easier to just get your baffles cut and silicone them in. if it needs to be custom and you have the tools, then building one form acrylic is probably the best route. are you going to get all the pieces cut / machined to size or will you be doing all that yourself?? i built mine entirely with my router, so i didn't have to clean up any saw cut edges. i have built other projects just using a table saw and weld on 16 but they wouldn't cause a huge mess if the bond failed. the biggest thing for solvent welding is edge prep, the water thin solvents used need for the material to be in full contact with each other. so all your parts must be square and fit together good or you will have huge problems during assembly. i'm not trying to scare you off, just make sure you know what your getting into. here's a pic of my DIY 60G acrylic sump, it was the biggest i could build out of 1 sheet. i also think i'm at or just past the limits of 1/4" acrylic, my next sump will definitely be made from 3/8". 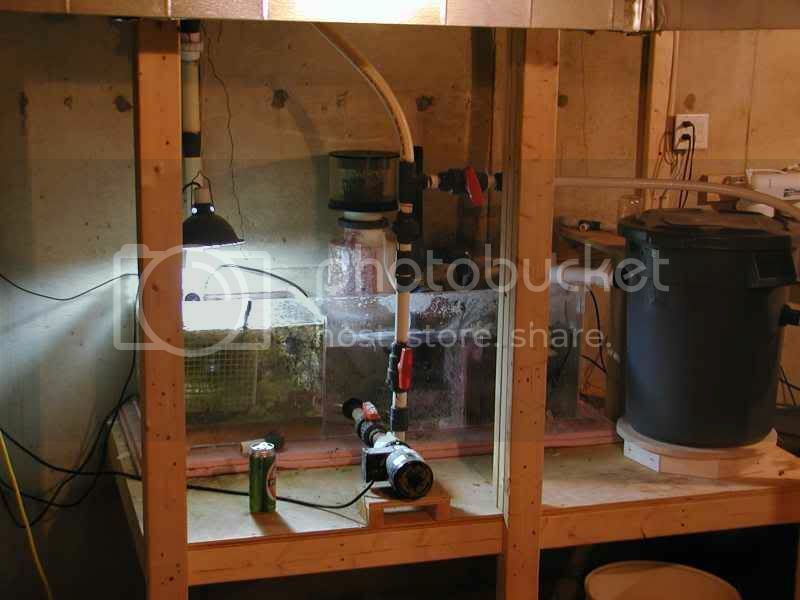 I really dont think it gets much cheaper the buying a used glass tank, and just adding baffles. Acrylic can be challenging but satisfiing once complete, but I think it will be more expensive then glass. yup.. a used glass tank is cheap for sure. its a personal choice.. I like the added strenght of acrylic. Thanks for the answers people. The edge need preping when using a table/mitre saw? Preping like sanding edges smooth I imagine. Worst case I have access to a router. I am still unsure which route I am going to take. I forgot to ask as well if it were all built with glass from a glass shop and assemble myself, price wise what am I looking at for a 24*24*18 inches sump? I am wondering if this stuff would be strong enough. Lucite Tuf - acrylic hi impact sheet and 3/32'' thick, it's the thickness I am mostly worried about. Would it be ok strengthwise in the corners? 1/4" minimum. and i'd go thicker for the added strength. as for getting a shop to build a glass sump, i'd say price should be in the same range as getting an acrylic sump.. maybe a little less.. thats if you can find a glass shop to do this. The edge need preping when using a table/mitre saw? Preping like sanding edges smooth I imagine. edges for solvent welding should be routered or run through a jointer, you can try using a scraper and sand paper but it's a very slow and frustrating process. the best thing would be to draw out your sump and create a cut list. then contact a glass and acrylic shop for a quote, get one for the pieces cut and one for both the pieces and assembly. if you still want to do it all yourself, also ask about a price for just the raw material. i found that building it from acrylic saved me money because i was able to do all the cutting / machining / assembly myself. it isn't as easy to do this with glass and i think this is where the prices will greatly differ. what size acrylic for sump?